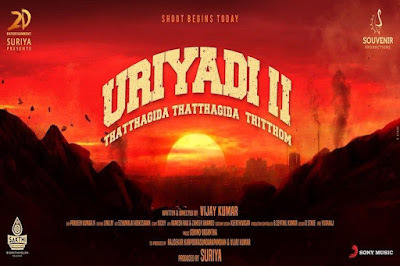 Cinematography : Praveen Kumar N.
Edited by : Linu M.
Uriyadi 2, Vijay Kumar has retained the caste politics that is set in a village revolving around a chemical plant (similar to Thootukudi Sterlite plant) which runs without proper approvals and which poses a big threat to the people around. Combine this with Bhopal gas lead tragedy and you get the bigger picture. Lenin Vijay (Vijay Kumar), a chemical engineer and his two friends are new recruits in the factory Paksino, which manufactures pesticides. Though the factory owned by an NRI was banned in the UK, the local politicians sanctioned it in India for their own gains. One of the workers die under mysterious circumstances and soon, Lenin loses his friend in a similar manner. Lenin gets suspicious of the factory’s poor maintenance and petitions to government authorities and the politicians, but all fall on deaf ears. Soon, when toxic gas leaks from the factory, it leads to a major disaster killing several people. It’s time for Vijay to get into action mode and how he does it forms the rest. Vijay Kumar has taken a relevant issue in hand for the sequel, but it is in his presentation where he lacks the punch. Vismaya as the female lead is natural and has given a neat performance. Everyone has done a neat job. In fact, their performances etch up substantiality for the roles. Musical score by Govind Vasantha is one of the biggest strengths for the movie.